Today, I want to take a moment to share with you the tried and true methods that I have personally used to improve my gluten free baked goods. The following tips truly are simple, but don’t let their simplicity deceive you–they really do work! Combine flours and starches for well balanced flavor and texture: If you read yesterday’s post, then you already know this, but I want to mention it again for those of you that are only just now tuning in. It is not uncommon for people that are new to gluten-free baking to think that they can simply substitute a single GF flour (such as rice flour) for wheat flour in a recipe and call it a day. More often than not, this is not the case, and the end result can be quite unpalatable. There are literally dozens of GF flour options, each with its own unique characteristics. Further, each of these will behave differently when baked. Some will absorb liquids, resulting in dry baked goods if you don’t anticipate this ahead of time. Others, have course gritty textures that will leave your finished product with an unappetizing grainy, mealy crumb if you don’t combine them with starches or a softer flour. Further still, there are some GF flour choices that will leave your baking with strong, pungent flavors if not properly diluted with other flour choices or spices. Without the addition of starches, your baked goods will likely be too dense/hard, too crumbly, and too dry. They may not rise properly, will likely crack and/or fall apart, and may even be more likely to burn. If you take one thing away from this article, let it be this: gluten free flours perform best when combined with starches and/or other GF flours. Using a blend of flours and starches (as opposed to a single flour), will improve the crumb, flavor, and elasticity of your baking. You can make your own blend, or purchase a gluten free flour blend (if you decide to purchase a blend, I recommend this one from Bona Dea , as it is my personal favorite). Let your batter rest for a while before baking: This is probably the easiest suggestion to put into practice, but it is also one of the most effective! As I mentioned before, GF flours behave differently than gluten based flours. This is due to the fact that gluten proteins are highly elastic, which makes it easier for them to bind with other grains. This is what results in the distinct texture that is exhibited in wheat based baked goods. Due to the very different ratio of starch to protein in GF grains, it can be difficult for the individual grains to stretch and bind with one another. If you have ever heard someone complain that GF foods are too grainy, gritty, course, or unusual in texture, this lack of granular elasticity is most likely the cause of the textural differences they are noticing. As bakers, we can encourage our starches and grains to stretch, bind, and hydrate on their own, with just a little bit of help. You can do this by letting your batters and doughs rest in the pan before putting them in the oven. I recommend doing this for 10-30 minutes. If you are skeptical that such a small step could make such a big difference, try the following experiment: Make a batch of gluten free muffins, and divide the batter in half. Put one half into the oven immediately, but allow the other half to rest at room temperature while the first batch of muffins bakes. When you have removed the first batch from the oven, bake the second batch. After both batches have cooled, take a moment to compare the texture of Batch 1 to that of Batch 2. You should be able to observe a noticeable difference. Use Xanthum Gum: Xanthum gum is a stabilizer and binding agent widely used as a food additive. When baking gluten free, it may be used to help bind your ingredients, thus improving texture and elasticity. Adding just 1 teaspoon to your baked goods can make a big difference, as a little bit of xanthum gum goes a long way. Before adding xanthum gum to your recipe, make sure you are not already using ingredients that contain it. Gluten-free flour blends and powdered egg replacers typically contain xanthum gum. You may also be able to skip the xanthum if your recipe already calls for gelatin or jello. Gelatin is a similarly sticky substance that functions similarly to xanthum gum. I also recommend purchasing xanthum gum packets to preserve shelf life, since you will generally only use very small amounts at a time. Lower your oven temperature: When it comes to baking, the standard baking temperature for most items is 350 degrees. When baking gluten free, however, you can usually get away with baking most baked goods (cakes, muffins, cookies, etc), at a lower temperature (325-345 degrees; I don’t recommend taking your temp lower than 325). If you have trouble with your baked goods baking evenly, being too dense, or rising poorly, lowering your temperature can help resolve these common issues. Just remember, if you do decrease the oven temperature, anticipate an increase in baking time. If even after you have lowered your oven temperature, you are still having trouble with you baked goods rising, try adding extra egg whites (if you can have egg), or increase the amount of egg substitute (if you can not have eggs). Make sure you are mixing correctly and adequately: This might sound like an obvious tip, but it is one that is easily overlooked. When baking cakes, cupcakes, or cookies, you should beat your batters and doughs longer and more vigorously. This will produce a lighter density and fluffier texture. Dense gluten free cakes are often the result of under-beating (as opposed to dense gluten based cakes, which are usually the result of over mixing). If you are making muffins, quick breads (such as banana or pumpkin bread), or cornbread you can mix just until combined (just as you would if you were making wheat based versions of these foods). I also recommend mixing these particular items by hand whenever possible. Always mix your dry and moist ingredients separately before combining, even if a mix or recipe instructs you to add everything all at once. Last but certainly not least, if you are using an electric mixer, I suggest following up with some brief hand mixing, scraping the bowl as you stir. This way you can be certain that you have thoroughly and evenly distributed all of the agents that are so crucial to rising and binding (i.e baking soda, baking powder, xanthum gum , gelatin, and/or egg replacer /substitute). *NOTE: Please check (and double check) any and all labels before you consume a new product if you (or your child) has a food allergy, and if necessary call the relevant manufacturer to confirm that the product is safe for you (or your child) to consume. Please consult your (or your child’s) Dr. before making any dietary changes. While I hope that all of you reading this will find the information I have supplied above to be helpful, this information is not intended to in any way replace, or supersede, the care and advice of your allergist, nutritionist, dietician, or other medical professional. There you have it—five simple tips to improve your gluten-free baking! After reading through the list, is there anything you would like to add? Any questions you would like to ask? If you answered yes to either of these questions, please leave a comment below. If you like what you read, and can’t wait to read more content like this, please subscribe using the short form at the bottom of the page. 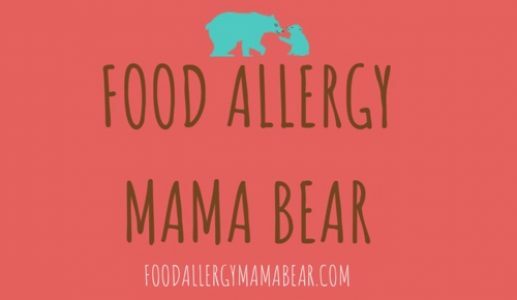 Next Post Food Allergy Mama Bear is now on Facebook! Thank you so much! It truly means a lot to me to hear you say that!